Proving the presence of all herbal raw materials in a formulation is a difficult and challenging task, which involves great effort and cost. Presently it is very difficult to identify the presence of all herbal ingredients as claimed in a formulation. Hence evolving a cost effective mechanism to identify and quantify various raw material markers in a formulation is a pre-requisite for standardization and industrial quality control. Quantitative estimation of bioactive compound classes such as alkaloids, flavonoids etc., can also be used for this purpose. Polyherbal formulations are the mainstay of Ayurvedic system of medicine. An Ayurvedic Physician uses an array of classical pharmaceutical dosage forms such as decoctions, medicated oils, ghee etc. Kaṣāyam (decoction) is one such dosage form which is highly practiced in Ayurveda across India, especially in Kerala. The decoctions were recommended to be made by the patients daily and used for daily consumption, after collecting the medicinal raw drugs according to the physician's advice. But this practice slowly became impractical in modern era due to various reasons. Therefore, the medicine manufacturers started to prepare concentrated decoctions, with added preservatives which can be easily diluted with boiled warm water and taken daily with convenience. Relevant studies are not available till date to standardize and compare the laboratory made and industrially made decoctions, using marker assays along with the physicochemical standardization to assure whether the marketed decoctions contain the same amount of active compounds as the traditionally made decoctions. Present study is an attempt made to manufacture and standardize a Laboratory Reference Standard (LRS) kaṣāyam (Ciruvilvādi Kaṣāyam, a simple and highly utilized decoction in Kerala used for treating various Gastro intestinal disorders) and standardize it using various physico chemical parameters and chromatographic techniques. As quantification of all raw material markers in the formulation was beyond the scope of this study, two important bioactive raw material markers, Gallic acid and Piperine were selected and used for standardizing the LRS. The standardization data generated was used to assess the quality of decoctions marketed by four different Ayurvedic pharmaceutical companies. Required raw drugs for manufacturing the LRS of Ciruvilvādi kaṣāyam were purchased from Thrissur herbal market [Table 1]. The purchased herbal raw materials were authenticated and standardized based on the macroscopic and microscopic features, and physico-chemical test parameters mentioned in Ayurvedic Pharmacopoeia of India and their Pharmacopoeial quality was ensured.,,,,,, Equal quantity of coarse powders of all the six ingredients (33.3 g each) of kaṣāyam were taken in a stainless steel vessel (total 200 g). 3200 ml of water was added, boiled and reduced to 1/4th (800 ml). The decoction thus obtained was strained through a clean cotton cloth. It was boiled again and concentrated to 1/4th (200 ml). 3 Batches of the LRS Kaṣāyam were made for analysis. Three sample bottles (200 ml) each of Ciruvilvādi kaṣāyam manufactured by four major pharmaceutical companies were purchased from Ernakulum and Thrissur during the month of June 2017. All samples were properly sealed and in good condition. 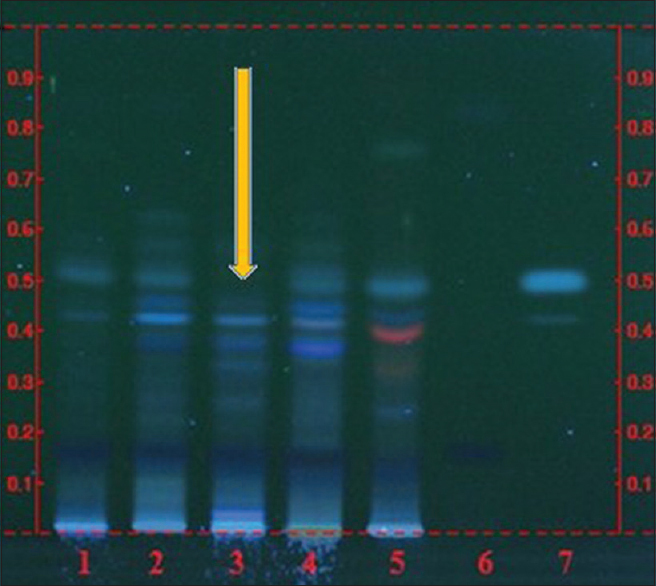 The labels were discarded and the samples were given the identification as sample I, sample II, sample III and sample IV. The pH was determined using a calibrated pH meter  (pH meter - Lab India make with Model No. PHAN). 50 ml of the clear sample was measured accurately and transferred to an evaporating dish which had been dried to constant weight and evaporated to dryness at 105°C for 3 hours on a water bath. The dish containing the residue was allowed to cool in a desiccator for 30 minutes. It was weighed immediately (W1) Calculation: Percentage of solids = (W1 × 100)/50. (In-house method) - a drop of the sample was placed to be tested on the lower part of a prism and the refractometer (Abbe. 5 make refractometer) was closed. The sample was observed through the eye piece and the dispersion correction compensator knob was turned until the coloured indistinct boundary seen between the light and dark fields became a sharp line. The knurled knob was adjusted until the sharp line exactly intersected the mid-point of the cross wire in the image. The refractive index was read from the magnifier in the pointer and recorded. 10 ml of sample was taken in a beaker and kept on water bath at 70 – 800 c for 2-3 hour until a dry residue was obtained. The residue was dissolved in 5 ml methanol and filtered through Whatman no. 1 filter paper. 100 mg of standard compound was dissolved in 100 ml methanol. Piperine and Gallic acid where the standard marker compounds (of Piper longum and Terminalia chebula) used. Toluene: Ethyl acetate: Hexane: Formic acid in a ratio of 6:3:1:0.5. Stationary phase: Silica gel aluminum plate 60F 254 (plate size 10.0 × 10.0 cm), Injection volume: 2 μl, Band width: 7 mm, Chamber type: Twin trough glass chamber 20 × 10 cm, Visualization: under 254 nm and 366 nm, Scanner: Camag TLC scanner. Gallic acid and Piperine are the standard marker compounds of the ingredient raw materials Terminalia chebula and Piper longum respectively. 5 g of sample was taken in a beaker and dissolved in 10 ml of water. The whole solution was filtered into a 25 ml standard flask using Whatman no. 1 filter paper and made up to 25 ml with water. Then the solution was filtered through 0.2 μm syringe filters and injected into HPLC system. 2.5 mg of standard Gallic acid dissolved in 25 ml water. Stationary phase: octadecyl silane chemically bonded to porous silica 4.6 × 250 mm – 5 micron (particle size), Mobile phase: 0.05% acetic acid (80%) acetonitrile (20%), Column: C 18 4.6 × 250 mm × 5 μm, Flow: 1 mL/min, Wavelength: 270 nm, Injection volume: 20 μl, Run Time: 6 minutes, Temperature: not controlled, Expected Rf: 3.1. minute. 5 g of sample was taken in a beaker and kept on water bath at 70 – 800 C for 3-4 hours until a dry residue was obtained. It was reconstituted with 10 ml methanol and filtered with Whatman no. 1 filter paper and made up to 25 ml with methanol. It was then filtered through a 0.2 μm syringe filter and injected into HPLC system. 2.5 mg of standard Piperine dissolved in 25 ml methanol. Stationary phase: Octadecyl silane chemically bonded to porous silica 4.6 × 250 mm – 5 micron (particle size), Mobile phase: Methanol (80%) water (20%), Column: C 18 4.6 × 250 mm × 5 μm, Flow: 1.2 mL/min, Wavelength: 342 nm, Injection volume: 10 μl, Run time: 10 minutes, Temperature: not controlled, Expected Rf: 3.9 minute. Statistical analysis was done by comparing the commercial Kaṣāyam samples (Sample I-IV) with Laboratory Reference Standard (LRS) Kaṣāyam. The statistical test used was One way Analysis of Variance (One way ANOVA), followed by Dunnet's Multiple Comparison Test using Graph Pad Prism software. Raw materials of Ciruvilvādi kaṣāyam were collected, and authenticated according to the macroscopy, microscopy and physicochemical parameters mentioned in API. Three batches of the Laboratory Reference Standard (LRS) Kaṣāyam were prepared. 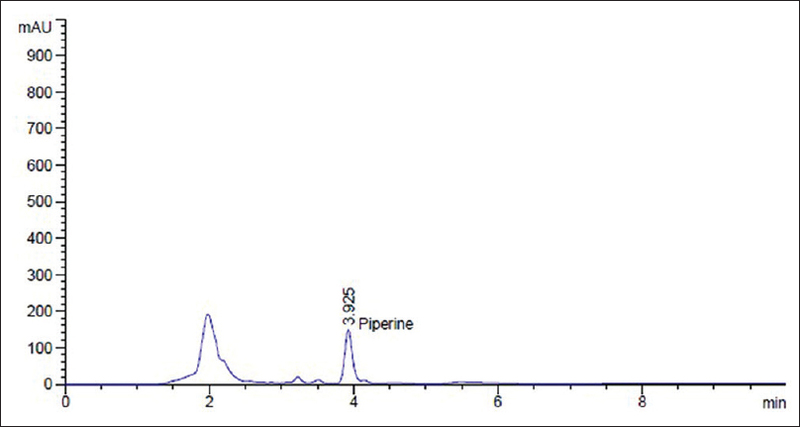 The physico-chemical parameters and the marker assay (Gallic acid and Piperine) of the LRS was compared with that of four different commercially manufactured Kaṣāyam samples (Sample I-IV). For the in- process and finished product standardization of concentrated Kaṣāyam, the commonly used parameters are Totals Solids, Brix and pH values. The pH values of the commercial samples of the Kaṣāyam except sample III, didn't show any statistically significant difference when compared to the Laboratory Reference Standard (LRS). 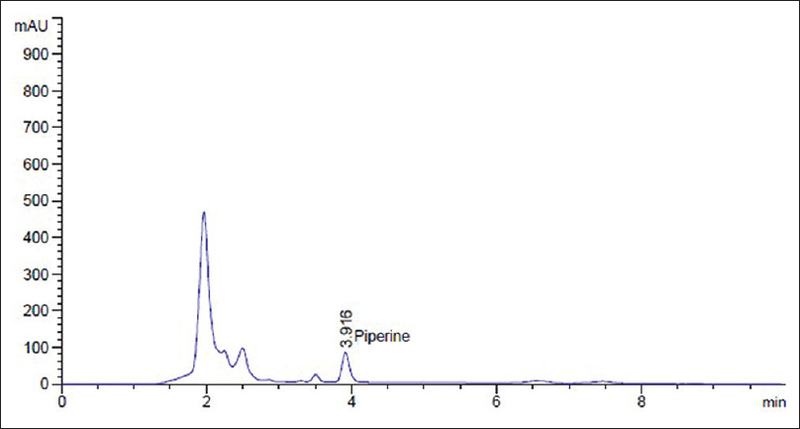 Sample-III showed a significant increase in pH (P y 0.001) compared to the LRS. So the sample I, II, and IV complies with the LRS with respect to the pH value. The less acidic nature of sample III is a clear indication of the low concentration of expected phytochemicals such as Gallic acid, Ellagic acid etc., [Table 2]. Total solids is a parameter which helps in the batch to batch standardization of liquid concentrated decoctions. It shows the sum total of dissolved and suspended solids present in the decoction. The % of Total solids of sample II and III were comparable to the LRS. So the reduction and concentration carried out in the manufacturing process was identical with the LRS. The % of Total solids of sample I was significantly low (P < 0.05), when compared to the LRS. Here the manufacturers probably didn't concentrate the Kaṣāyam sufficiently as was done to the LRS. But in the case of sample IV, the % of Total solids was very significantly higher (P < 0.001) when compared to the LRS. Here the manufacturer may have concentrated the Kaṣāyam much more than LRS [Table 3]. Brix value is an indicator of the amount of dissolved solids in a solution. This test is widely used in the in-process quality control, during the manufacturing of Kaṣāyam formulations to control the dissolved solid concentration. The Brix value pattern almost coincided with the Total solids pattern. Though the Brix value of sample I was low, there was no statistically significant difference when compared with the LRS, as the undissolved suspended solids in sample I was very low when compared with the LRS. But the sample IV produced a very high statistically significant (P < 0.001) Brix value when compared with the LRS. Sample II and III were again comparable with the LRS. So the Brix value was also found to be directly proportional to the concentration and sample IV has a significantly high amount of dissolved solids present when compared with all other samples [Table 4]. The Phytochemical analysis was started by The HPTLC comparative finger print profiling of the samples (I-IV), and the LRS alongside the two markers Gallic acid and Piperine at 254 and 366 nm. From HPTLC analysis, it was confirmed that Gallic acid is present in all the samples tested as Terminalia chebula, one of the ingredients of the Kaṣāyam, is a good source of Gallic acid. 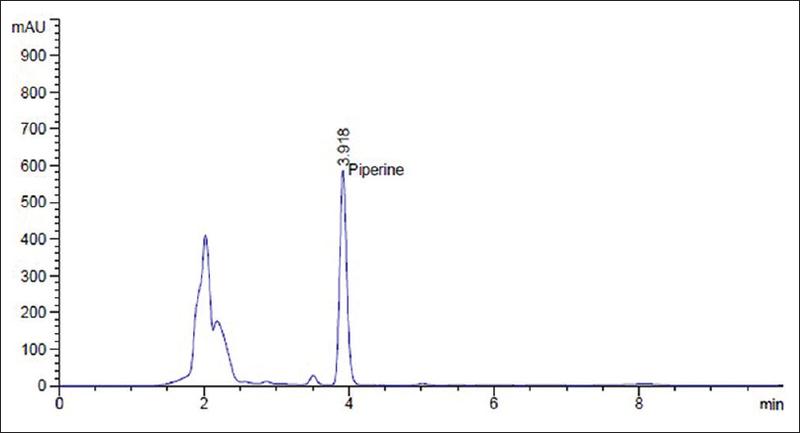 Piperine was present in all samples except sample III. 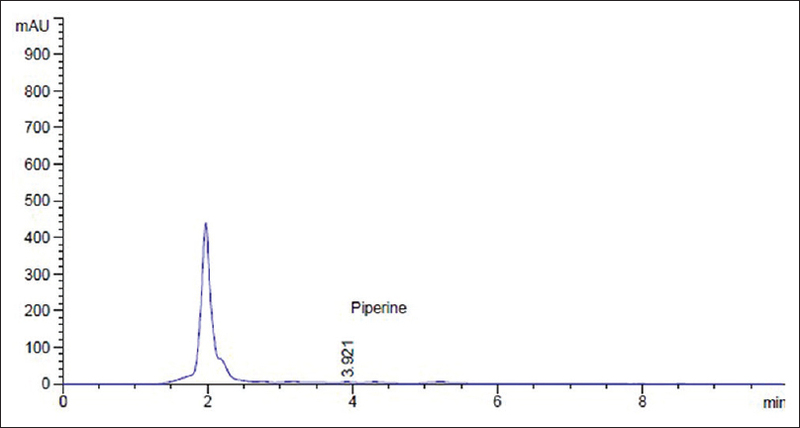 So it can be confirmed that Piper longum was not added/added in very low quantity during the manufacturing of sample III [Figure 1] and [Figure 2]. The Assay of Gallic acid and Piperine in all the samples were carried out using HPLC (High Performance Liquid Chromatography). There was no statistically significant difference in the quantity of Gallic acid in sample I and II, when compared with the LRS. 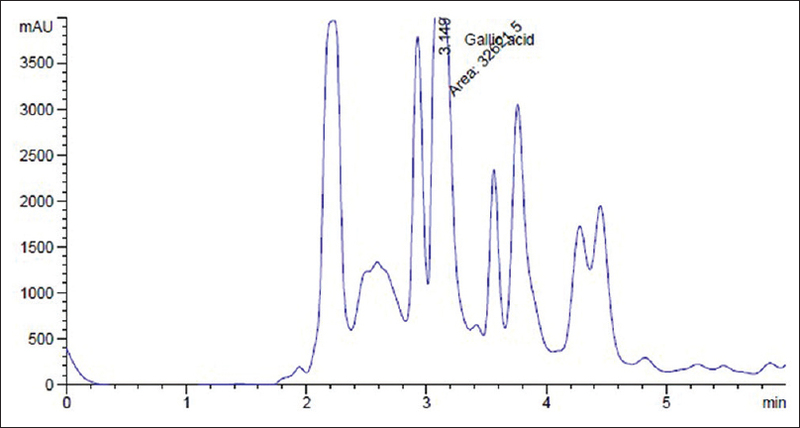 Sample IV had a significantly greater quantity (P < 0.001) of Gallic acid than LRS which may be due to factors such as high concentration, difference in manufacturing process reducing the thermal disintegration of Gallic acid and usage of Terminalia chebula with high Gallic acid content. But sample III showed a very low extraction of Gallic acid with quantification values significantly low (P < 0.001) when compared to the LRS, which was expected from its low acidic nature. So the manufacturers of sample III either didn't optimize the temperature to prevent the Gallic acid degradation or didn't use Terminalia chebula with good Gallic acid content. Also there is a chance of low input quantity of Terminalia chebula in sample III [Table 5] and [Figure 3], [Figure 4], [Figure 5], [Figure 6], [Figure 7], [Figure 8]. 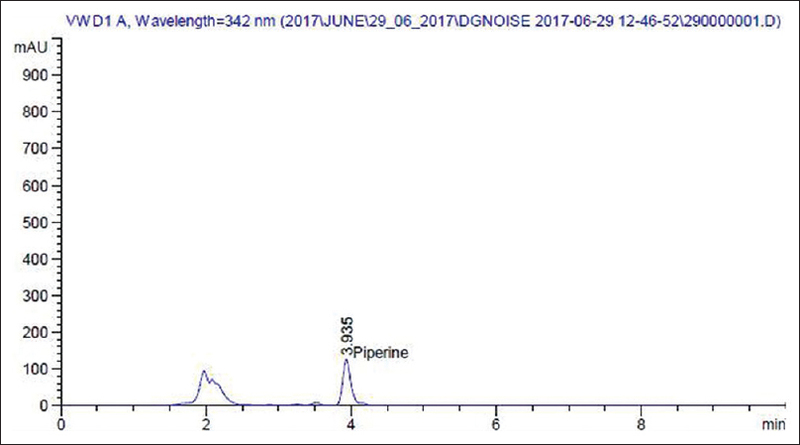 The quantity of Piperine in commercial samples I, II, and IV were significantly low (P < 0.001) when compared to LRS. This may be due to the less Piperine content in them owing to different seasonal and geographic variations related to place of collection or less input quantity of Piper longum. Sample III showed zero concentration of Piperine which indicates a very less or zero input quantity of Piper longum used in manufacturing[Table 6] and [Figure 9], [Figure 10], [Figure 11], [Figure 12], [Figure 13], [Figure 14]. The results of the study encourages the combined physico-chemical standardization, HPTLC fingerprinting and marker assay of selected and available marker compounds to be used in industrial quality control. In conclusion, the LRS 'Ciruvilvādi kaṣāyam' was made, standardized and compared with four marketed samples using physicochemical (pH, Brix and Total solids) and phytochemical parameters (HPTLC comparative fingerprinting and HPLC quantification using Gallic acid and Piperine as standards). Results of Brix and Total solids imply that, the manufacturing process of sample IV was significantly different from other samples and LRS. pH value of sample III showed a significant difference compared with other samples and LRS, indicating a difference in phytochemical content. 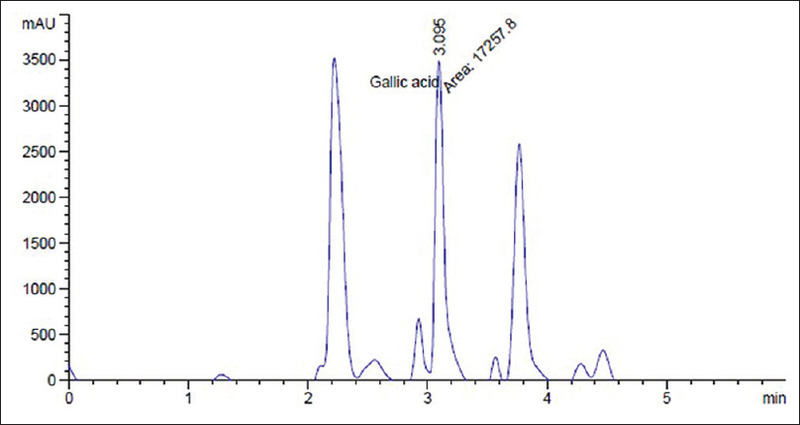 The concentration of Gallic acid in sample I, sample II were comparable to the LRS. But sample IV showed a very high concentration of Gallic acid when compared with LRS. 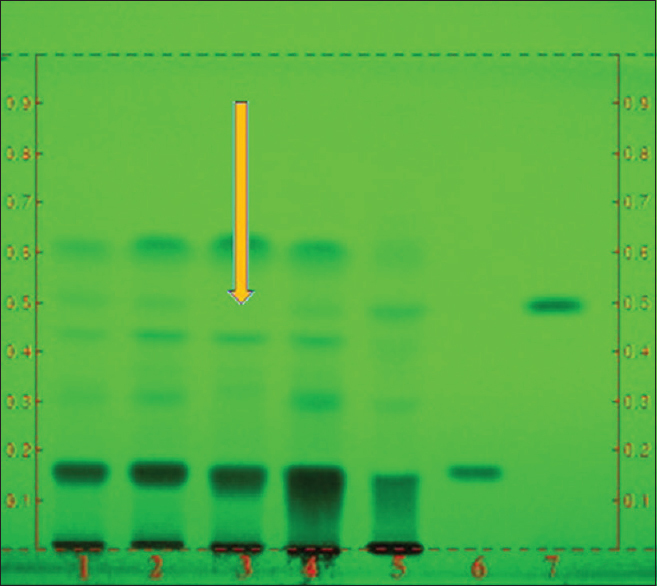 Sample III showed a significantly less concentration of Gallic acid compared to LRS. Concentration of Piperine in sample I, II and IV were significantly low when compared to LRS and that of sample III was zero. 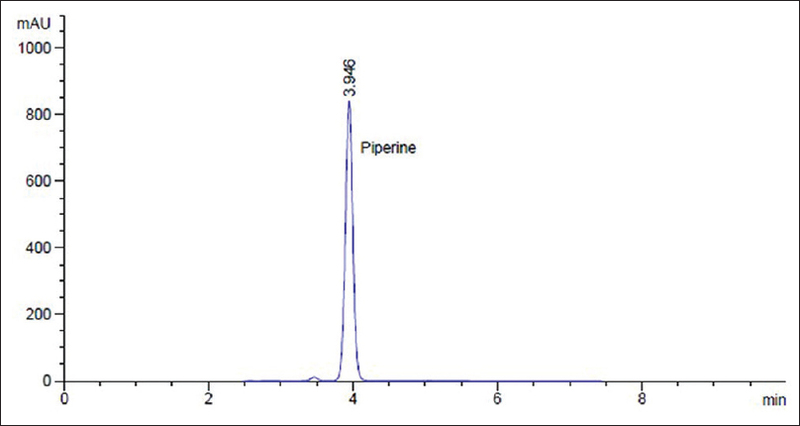 The zero value of Piperine in sample III indicates the very less/zero input quantity of Piper longum used in manufacturing. This means that the raw material, in-process and finished product quality control of the formulations must be followed strictly to ensure that the marker assay values are maintained comparable to a Laboratory Reference Standard or Pharmacopoeial standards if available. The study also shows that only physico-chemical analysis which is widely practiced to maintain the batch to batch standardization is not sufficient in quality control of Ayurvedic formulations. Phytochemical analysis should be incorporated. The methodology can be adopted for the industrial quality control of other formulations also. Gautam V, Raman RM, Ashish K. Exporting Indian Healthcare (Export potential of Ayurveda and Siddha products and services). Road Beyond Boundaries (The Case of Selected Indian Healthcare Systems). Mumbai: Export Import Bank of India; 2003. p. 14-54. Vaidya AD, Devasagayam TP. Current status of herbal drugs in India: An overview. J Clin Biochem Nutr 2007;41:1-1. Yadav N, Dixit V. Recent approaches in herbal drug standardization. Int J Integr Biol 2008;2:195-203. Sagar BP, Zafar R, Panwar R, Kumar V, Mangla A. Herbal drugs standardization. Indian Pharm 2005;4:19-22. Patra KC, Pareta SK, Harwansh RK, Kumar KJ. Traditional approaches towards standardization of herbal medicines – A review. J Pharm Sci Technol 2010;2:372-9. Wani M, Parakh S, Dehghan M. Herbal medicine and its standardization. Pharm Rev 2007;5:1-6. Vaidyan KVK, Pillai GS. Sahasrayoga or Chikitsa Sara Sarvasvam with Sujanapriya Commentary. 27th ed. Alappuzha: Vidyarambha Publishers; 2007. p. 50. Ministry of Health and Family Welfare, Government of India. The Ayurvedic Pharmacopoeia of India. Part 1. 1st ed., Vol. 1. New Delhi: Ministry of Health and Family Welfare, Government of India, The Controller of Publications; 1990. p. 29, 47, 95, 103. Ministry of Health and Family Welfare, Government of India. The Ayurvedic Pharmacopoeia of India. Part 1. 1st ed., Vol. 4. New Delhi: Ministry of Health and Family Welfare, Government of India, The Controller of Publications; 2004. p. 91. Gupta AK. Quality Standards of Indian Medicinal Plants. Vol. 1. New Delhi: Indian Council of Medical Research; 2003. p. 22. Gupta AK, Tandon N, Sharma M. Quality Standards of Indian Medicinal Plants. Vol. 5. New Delhi: Indian Council of Medical Research; 2008. p. 246-55. Gupta AK, Tandon N, Sharma M. Quality Standards of Indian Medicinal Plants. Vol. 7. New Delhi: Indian Council of Medical Research; 2008. p. 218-26. Tandon N. Quality Standards of Indian Medicinal Plants. Vol. 9. New Delhi: Indian Council of Medical Research; 2011. p. 59-71. Tandon N, Sharma M. Quality Standards of Indian Medicinal Plants. Vol. 8. New Delhi: Indian Council of Medical Research; 2010. p. 347-56. Ramadevi R. Bhaishajya Kalpana. Part 1. Cherpulassery: Perfect Publications; 2010. p. 133-43. Government of India. The Ayurvedic Pharmacopoeia of India. Part 1. 1st ed., Vol. 9. Ghaziabad: Pharmacopoeia Commission for Indian Medicine and Homoeopathy, Ministry of AYUSH, Government of India; 2016. p. 114-5. Lavekar GS, Padhi MM, Pant P. Laboratory Guide for the Analysis of Ayurveda and Siddha Formulations. New Delhi: Central Council for Research in Ayurveda and Siddha; 2010. p. 54.